There comes a time when all hairy boys need to go to the barber - yesterday it was time for Eric and Leslie. 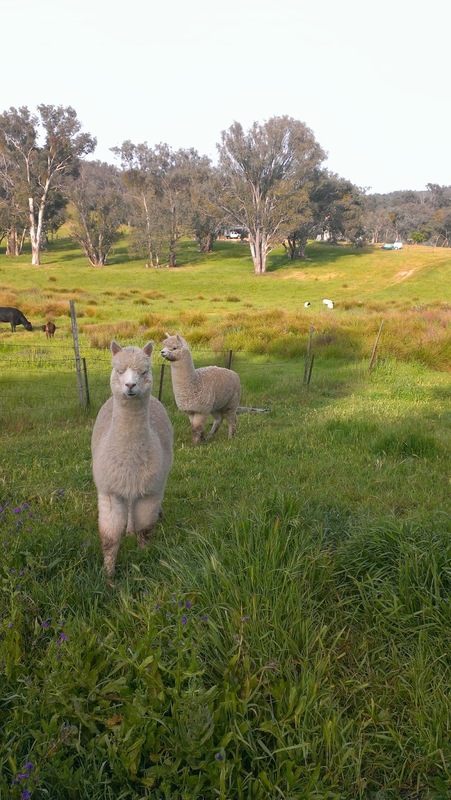 Eric and Leslie are our two alpaca wethers. They are guardians for our sheep, protecting the lambs in particular from foxes and wild dogs. So far they have been pretty good at their job. Now that the hot weather is approaching it was time for a trim. 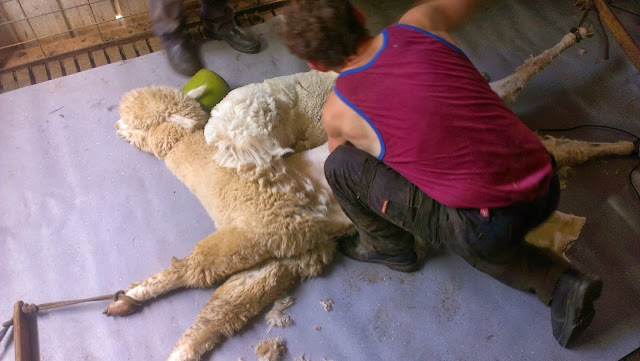 Alpacas are shorn by specialist alpaca shearers - the method is quite different from the shearing of sheep. 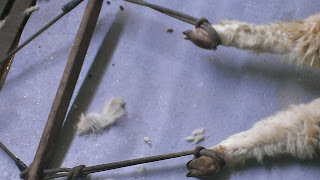 The animals have their legs shackled and their necks weighed down to stop them from moving. They do a fair bit of high pitched screeching while they are being trimmed. 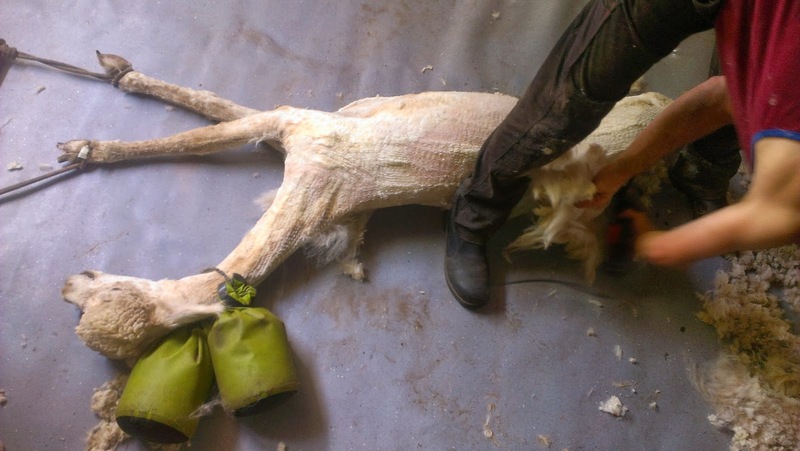 While I am sure the animal doesn't really like to be handled like this the process was quick and appeared pain free and safe for animal and shearer. 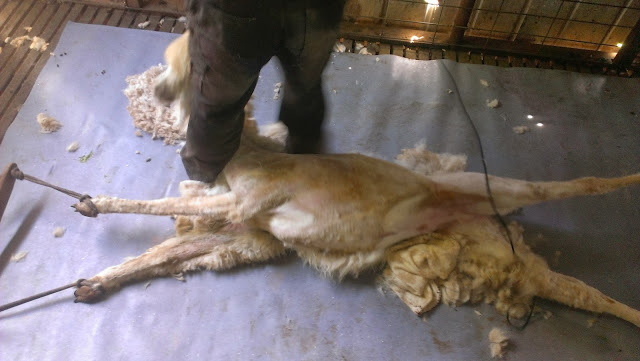 The shearers James and Zac did a great job - no nicks at all. I am certain that the alpacas must feel so much more comfortable with their fleece off in the hot weather but they do look like aliens. 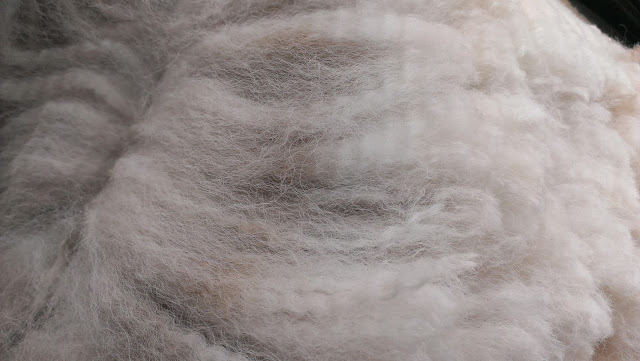 While we have the alpacas primarily for their guardian role, their fleece is too good to waste and I can't wait to revive my spinning skills and get my hands on their soft coats. You spin? Are there no end to your talents? They do look a little ET like, post trim, but gorgeous, nonetheless. Well, I USED to know how to spin... let's see if I still have the nack. I will have to find a cheap second-hand wheel from somewhere, but first, I'd better finish the other projects I have on the go - a cardi for The Lad, a very big crocheted rug and some cushions made from hessian bags. They ARE odd, with or without their wool. 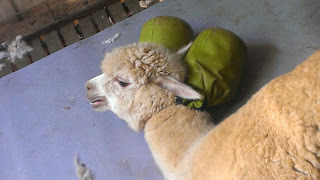 But they are also very gentle and pretty easy to handle. You just need to avoid their spit! I might also try felting some of the poorer quality wool? 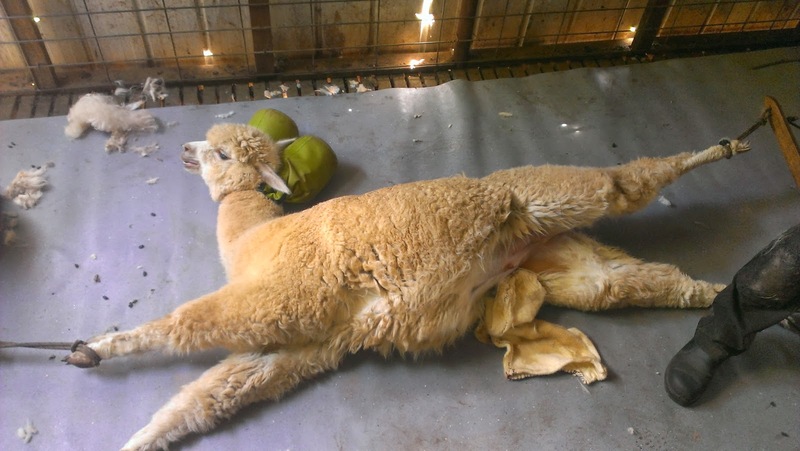 Matt just gave me a quick ring to let me know you've hard two alpacas shorn. I've just bought three baby alpaca fleeces on Ebay (from near Bundaberg in Qld). They're dark brown and I have yet to spin them too. I've been told to comb them with a simple cat comb and line them up so the cut sides all face the same way. Apparently, you spin the cut edge first. I've only just learnt to spin prepared fleece so this will be fun. There's a little vegetable matter in the fleeces so it'll be fun picking that out. Once spun, I'll wash them. 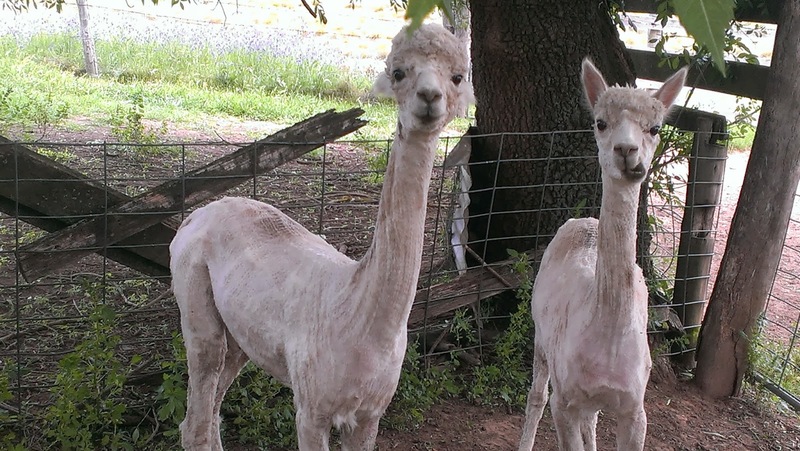 Don't they look funny after they've been shorn? Very helpful hints Mel! I have also heard that alpaca fleece doesnt pull out like sheep wool does, also it doesnt have that lubrication that natural lanolin in sheep's wool has. I will give ity a go and see how I get on, good luck with your brown fibre! sick...that poor animal. Lets shave you with a bag of weights over your head while carving your crotch! inhumane..